In the past few months, ChinaDivision has constantly launched order fulfillment apps/extensions for Shopify, OpenCart, WooCommerce, Magento and eBay, all of them have helped ChinaDivision customers to streamline their e-commerce business and fulfill orders from different stores automatically. (BigCommerce Order Fulfillment) We have been receiving a lot of positive feedbacks for the smoothly running order fulfillment integration, now we launch another one, ChinaDivision BigCommerce Fulfillment App. As we know that BigCommerce is a powerful e-commerce platform which has helped a lot of global online retailers to succeed. 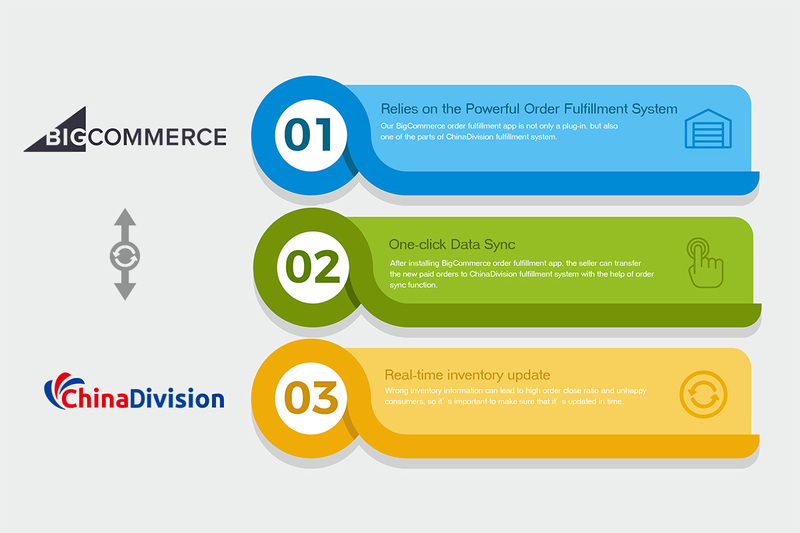 ChinaDivision order fulfillment app is a full-function tool for e-commerce business owners to sync data between BigCommerce stores and ChinaDivision order fulfillment system. If you own a BigCommerce store and sell products globally, you need this app. ChinaDivision BigCommerce order fulfillment app is specially developed for global e-commerce business, instead of spending a lot of money on running multiple warehouses worldwide, the BigCommerce store owners can out-source the order fulfillment to ChinaDivision and still get a seamless e-commerce business, just think of us as your in-house fulfillment team. If you source products from China, you need this app. ChinaDivision is located in Shenzhen, China, very close to Hong Kong. (BigCommerce Order Fulfillment) Relaying on the world’s biggest e-commerce wholesale platform (Alibaba), the super-quick China domestic shipping and the superior location, ChinaDivision are capable to help the BigCommerce store owners ship the cost-effective products out within 24 hours after the orders are placed. More than that, the near-source fulfillment solution provided by ChinaDivision can help the BigCommerce store owners save a lot of logistics fees. If your products have complicated SKUs, you need this app. Selling products with complicated SKUs, such as clothing, accessories or Phone cases, has particularly high requirements for the fulfillment system. ChinaDivision BigCommerce order fulfillment app can reduce errors by making all the processes automated. Without too many manually data transfer, the tech-oriented order fulfillment ensures that the buyers will always get what they ordered. If you want to fulfill orders from multiple stores, you need this app. Using a single ChinaDivision account, the BigCommerce store owner can fulfill orders from different stores and manage the inventory centrally. (BigCommerce Order Fulfillment) All the ChinaDivision order fulfillment apps/extensions support order number prefix customization, which means the e-commerce business owner can run multiple BigCommerce, Shopify, eBay, Magento, WooCommerce stores in the same time and still fulfill the orders centrally. Relies on the powerful order fulfillment system. Our BigCommerce order fulfillment app is not only a plug-in, but also one of the parts of ChinaDivision fulfillment system. The effective inventory management, experienced manual operation and one-stop fulfillment service can help the BigCommerce store owners to establish a good brand image and improve the customer satisfaction. After installing BigCommerce order fulfillment app, the seller can transfer the new paid orders to ChinaDivision fulfillment system with the help of order sync function, they can choose to do it automatically (once the buyer place the orders, the orders will be synced to the fulfillment system) or manually sync orders by clicking Create Order button once a day. (BigCommerce Order Fulfillment)After ChinaDivision processed the orders, the tracking numbers can be synced to the BigCommerce store and sent to the buyers through e-mails as well. Wrong inventory information can lead to high order close ratio and unhappy consumers, so it’s important to make sure that it’s updated in time. ChinaDivision will subtract or add the corresponding quantity in total inventory once the products are purchased or returned, this can really take the hassles away when there are a lot of products come and go during peak seasons. Step1. Install ChinaDivision BigCommerce Order Fulfillment App. You can get our BigCommerce order fulfillment app here. Authorize ChinaDivision order fulfillment app to your BigCommerce account, this ensures that ChinaDivision can collect data from your BigCommerce store. Step 2. Define your using preferences of the app. You can set the order number prefix here to avoid the existence of same order numbers when you fulfill orders from multiple stores. Step 3. Start to sync orders and let ChinaDivision take care of the rest. We will launch order fulfillment apps or extensions for more e-commerce platforms, please stay tuned.